The most sensitive dark matter detection experiment is now sitting on almost 150 days of unpublished data, in addition to the small bone of 11 days they threw us in early 2010. 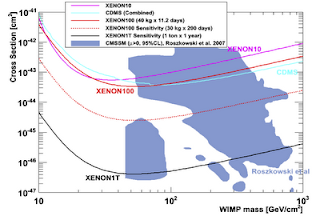 The new results should be published some time soon, although Xenon100 does not commit to a specific date. 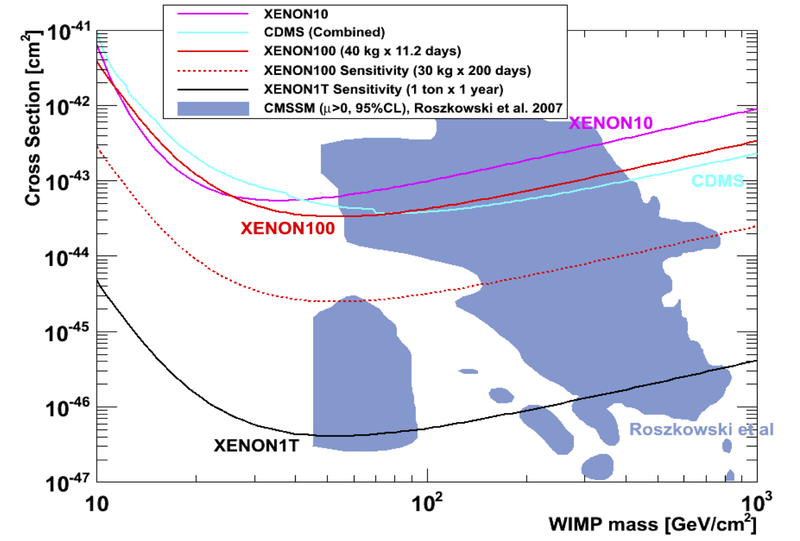 The prospective limits on dark matter - nucleon cross section should not be too far from the dotted red line on the plot (which assumes 200 days)....unless the signal is there. If not this year then when? It's probably the final year of running for this machine. At this stage it is unlikely that new physics will jump in our faces, unless it is concealed in some truly exotic channel that nobody has thought to look at so far. Nevertheless, the Tevatron still has a potential to provide some excitement this year. First of all, there will surely be new Higgs limits this summer: another chunk of Higgs masses will be crossed out, and maybe we'll even see a 2-sigma hint of the real thing. 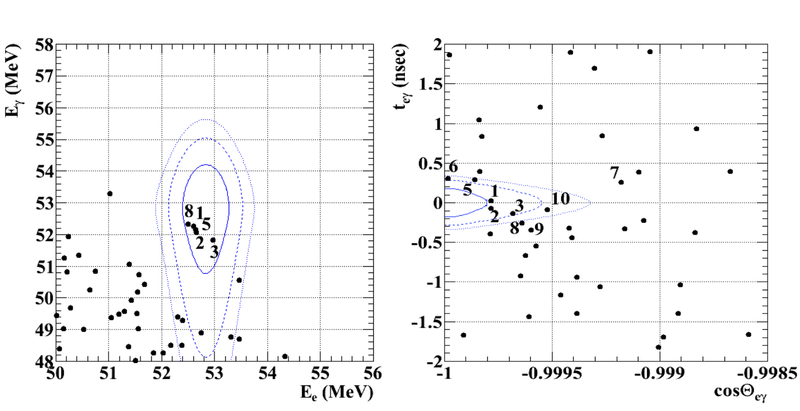 On the new physics front, we are waiting for updates on CP violation in the B-meson system, as this is the place where the most intriguing anomalies have showed up. And, who knows, maybe some other 2-sigma blip will be promoted to a 3-sigma blip, the good candidates being the forward-backward top-quark production asymmetry, the t-prime hunt, or the Higgs partner search in the 3-b channel. This neutrino telescope, named in honor of the gansta rapper, has just been completed last month. IceCube is a chunk of ice at the south pole where high energy muon neutrinos are invited to convert into muons, whose Cherenkov radiation is then detected by strings of photomultipliers embedded in the ice. These new eyes on the universe will surely bring a fascinating progress into conventional astrophysics. 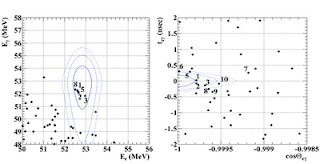 Can there be hints of new physics in cosmic ray neutrinos, or in neutrinos from the Sun? Why not. This one could be a dark horse, although it's not even clear if they will be joining the race this year. MEG is another experiment with muons at PSI, Switzerland. It is looking for the μ →e γ decay whose rate is unobservable in the Standard Model, but could be easily enhanced in many of its extensions. Last summer at ICHEP MEG presented the results of an early 2-month run that showed an intriguing clustering of events near the signal region (although none of the events passes the timing + angle cuts). They're planning to continue running until the end 2012 so as to bring the sensitivity down to 10^-13 branching fraction. But if the events keep popping up we may hear about them sooner. This year it will be more quiet up there . The AMS-II experiment is going to be launched to the ISS early this year (unless they decide to replace their magnet with a refrigerator magnet) but we'll have to wait years for any interesting results. PAMELA and Fermi are still up there and we may still learn something new about the cosmic ray spectrum. But, most likely, the sky won't rock before 2012 when Planck publishes their first CMB analysis. If i forgot something to be impatient about, don't hesitate to point it out. But that's only foreground maps. Interesting for astrofreaks, but nothing for particle physicists yet. Actually no, Jester. I am quite interested in the temperature of the cold gas. Your linear fall doesn't look like the best fit to the data! So it is the same as your straight line for small values, but starts to flatten out for larger values of x, when 1 - x is an underestimate, as indicated by some of your data.